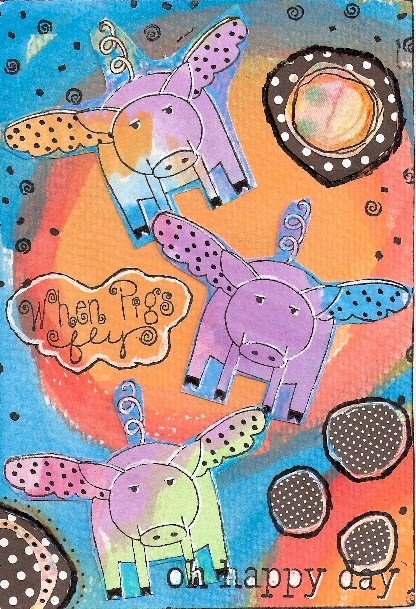 This is a 4x6 mixed-media postcard I created using two newly released stamps designed by my friend Roc Nicholas for Stampotique: Flying Pig and When Pigs Fly Text. 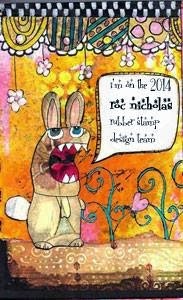 Be sure to check out all of her designs. The pig isn't the only adorable creature available! i just love everything about this. the colors are so awesome to me! great job. I work for the company that produces Mutual of Omaha’s ‘aha moment’ campaign; check out www.mutualofomaha.com/aha to see what an aha moment is and the incredible stories we’ve filmed over the last several years. As I came across your website, I couldn’t help but think that you might have an aha moment to share. For the 5th year, we’re taking our 34-foot Airstream mobile film studio on the road again for the 2014 Aha Moment Tour, visiting 20 cities across America to capture inspirational, life-changing aha moments from folks all over the country. We are headed to Redding, CA on May 12th and 13th and would love to invite you to share an aha moment, and how your life has changed since. It can be about your work, your family or other life experiences. You would just have to step into the Airstream studio for a few minutes and tell your story on film to our tour producer. Your video will then be posted to www.mutualofomaha.com/aha, where you will be able to share it with your friends and family via email, Facebook and Twitter! We’d love to have you. Let me know as soon as possible and I can reserve your time slot. Love those flying pig stamps - and what you've done with them. Cool colour palette!